How quickly can we get fruits from a jackfruit plant? 'J.33', a Malaysian variety is probably the one with the shortest gestation period. According to reports, this variety - also known as 'Tekam yellow'- starts yielding fruits in just eighteen months after planting. J-33 jackfruit is also very sweet. Its latex content is low. The Malaysian Agriculture Department recommends this variety for export. Commercial orchards that have planted this variety have already started marketing the fruit in their domestic market. Now, a variety that yields fruits nearly as fast as 'J-33', if not faster, has come to light in Maharashtra. Prakash Sawanth, a 61-year-old farmer at Nane in Thana district has this unnamed cultivar that yields fruits in eighteen months. Such performance has rarely ever been recorded in the whole country. India boasts of being the motherland of jackfruit. But unfortunately, we still haven't started commercial cultivation of this fruit. We just dibble a seed or plant a seedling and then forget about it. Jackfruit remains largely a 'naturally growing' crop in homesteads or a scattered border crop for which farmers do nothing except harvest the fruits. Harvesting also is not done as a matter of routine . the fruits are often allowed to fall and rot! But Prakash Sawanth clearly thought otherwise. Sawanth got a jackfruit graft 4-5 years ago from a fellow farmer, Babanchuri of Dahanu. According to him, this variety came from Singapore a few years ago, which is why his family has named it 'Singapuri.'. Babanchuri has a bigger tree of this variety. Prakash pays a lot of attention to the management of his jackfruit plants. He digs a 5-6 feet deep pit, fills it with a mixture of farmyard manure and loose soil and plants the graft on top. Except for monsoon, water soluble fertilizers are applied directly or through drip irrigation periodically. India boasts of being the motherland of jackfruit. But there hasn't been much commercial cultivation of the fruit.  Humble fruit or haute cuisine? The efforts bore fruit in the second season itself, as the new jackfruit plant gave fruit. Hailing from a farming family of Kankavli, Konkan, Sawanth was quick to realize the speciality of this variety. He started multiplying the plant through grafting. "Two-three grafts would turn out to be successful out of the ten odd that we used to make," he recalls. According to Sawanth, with the exception of hand-counts of progenies of the mother Singapuri tree, all others have given yield in the second calendar year itself. Adds his son Abhijeet, a horticulture graduate who helps his father in farming, "If the plant is still very small, we don't allow the tender fruit to grow. We cut it off." "This is the tastiest jackfruit I have eaten so far," hails Sawanth. The carpels have an unusual saffron colour. When it is properly ripened, the characteristic latex disappears making it easier and more comfortable to cut and clean the harvest. "You don't require to smear your hands with oil before cutting this variety as is usually the norm with this fruit," points out Abhijeet. Sawanth Farm, spread over 17 acres, is situated 80 kilometres from Thane city. It is just 25 kilometres from the Palghar railway station. The nearest town, Wada is twenty kilometers from this farm. Banana and Papaya are the main crops of this farm. Coconut and Mango are also present in small quantities. Sawanth's mother jackfruit tree is planted in a shaded area. So its growth and yield is less. But the new grafts made from the mother tree are planted in better places. Now the farm has a total of 25 to 30 jackfruit plants of this 'Singapuri' variety. "Out of these", points out Sawanth, "ten plants are seedlings. Seedlings start yielding from the third year. Interestingly, seedlings too have retained the mother characters whereas seedlings being true to type are very rare in Jackfruit." Prakash Sawanth with his unusual jackfruit tree. Another outstanding character of this variety is its twice-bearing habit. The staggered bearer gives fruits in a phased manner - December to March is the main season which continues till May. After a short break over June-July, it starts yielding again from September. "This year, due to heavy rains, a good number of fruits rotted. We got only two fruits in October. Now there are many tender jackfruits and it is still flowering." Jackfruit trees are very rare in Thane district. Over the last four years, this family might have harvested about 200 to 300 Singapuri jackfruits. All these years, they have mostly gifted the fruits to friends and relatives. Very few were sent to the market. When the crop yield is very high, they resort to 'thinning' by cutting off the excessive fruit just after pollination. So, what is the main reason the 'Singapuri' variety bears fruit so fast? Is it the very fertile alluvial soil? Is it good management? Or is it merely its genetic character? The soil is very fertile. This farm is located on the banks of Vaitharna river. "Our soil is so fine-grained that you won't even get a small stone in this," says Sawanth; "such fertile alluvial soil is the blessing of our river Vaitharna." A lot of organic material is deposited on the land with every rising flood in the river. Sawanth's management is also intensive. Very few Indian farmers have provided drip irrigation, mulching and periodic manuring in the manner in which he has. "I look after these plants," he says, "as my own children." Apart from the Singapuri variety, Sawanth Farm has jackfruit trees of other varieties too. A seedling brought from the owner's native village of Kankavli is one. This too started bearing fruit in its fourth year . much faster than the usual 6-7 years that seedlings take. But seedlings of other varieties that Sawanth has planted here have taken the usual gestation period of 6-7 years before yielding fruit. The Singapuri fruit weighs anything from 5 to 15 kg. "In the second year, it gives just one or two fruits. We get 5-6 fruits more in the third year. 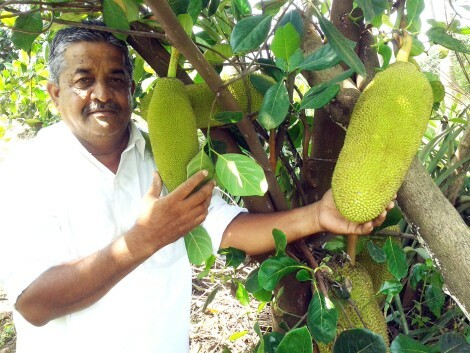 I haven't seen or heard of a jackfruit variety in the entire country that yields so well and fast," says Sawanth proudly. In January this year, Abhijeet had presented a graft of this variety to his neigbour Dhanu Shingda. This was planted in a tin can that holds 10-15 kilos of soil. The graft has not yet been transplanted to the soil. But even as it is still in the can, it has borne two fruits. "Irrespective of whether these fruits survive and grow or become spoiled, this is an indicator of its genetic speciality," analyses Abhijeet. Recently Channegowda, a jackfruit lover from Hassan district of Karnataka brought a fruit of the Singapuri variety to his home. However the fruit was not mature enough and took very long to ripen. "It's sweet and the colour is saffron. But the size of the seeds is bigger than normal, making the carpels a bit thin. The 'fill' or edible portion in the fruit is smaller," he feels. It is perhaps a little early to draw long term conclusions as Sawanth's plants of this unusual jackfruit variety haven't yet attained the age when their yield can be said to have stabilised. The fruit and yield are yet to be evaluated for different parameters. Multi-location trials too have to be conducted to find out its suitability to alternative conditions. Going by the indications available now, it may or may not be an excellent fruit in all respects but with its very early yield, staggered twice-a-year bearing and latex-less bulbs of unusual hue, this variety certainly has enough potential to attract both commercial jackfruit farmers as well as those who plant it for domestic purposes.